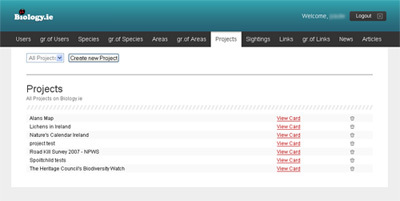 Last week we soft launched v2 of Biology.ie, the website for tracking nature throughout Ireland across the seasons. This is a major update both in design and the functionality offered. 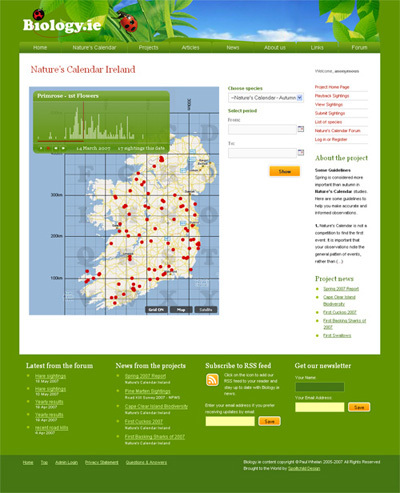 The launch coincided with the launch of Biodiversity week and the Heritage Council partnered with Biology.ie to release a custom version of the map for the event. Those maps and the ongoing roadkill study being conducted by the National Parks and Wildlife Service provided quite an interesting set of requirements and a heavy duty back end to organise it all. This has been the baby of Bartek and Tom here over the last few months and they have developed a really powerful and perhaps more importantly a really easy to use application to manage the research requirements. So with great pleasure let me introduce version one of Here Be Dragons, a mapping and research tool designed for academic research. How it works in practice is an organisation can either install the application on their own server or go with the hosted managed option. Then any number of maps can be simply set up for various research projects with various levels of user permissions for submitting and interacting with that data. It will basicly record sightings of any object, its date, location and will also automatically pull in the local weather of that sighting. Researchers can also upload and link any photos, files, notes, video, sound with that sighting for future reference. At the moment is is using Yahoo maps as they provide the most detailed information but we are actually using a common api so the mapping service is interchangeable. I wont bore you with the science bit but it does export the research data in irelands propriety format called the Irish Grid system (UK too) and the more standard gps data. Going against the norm for research software the guys have worked hard on making the back end as easy to use and manage as possible. You can go visit www.biology.ie and have a look at how the front end works. Its a project and application we are really proud of and see a bright future for.